It probably took no more than 27 seconds for the word to spread like wildfire when the TYWO website went live last May, with details of the 2013-14 season. 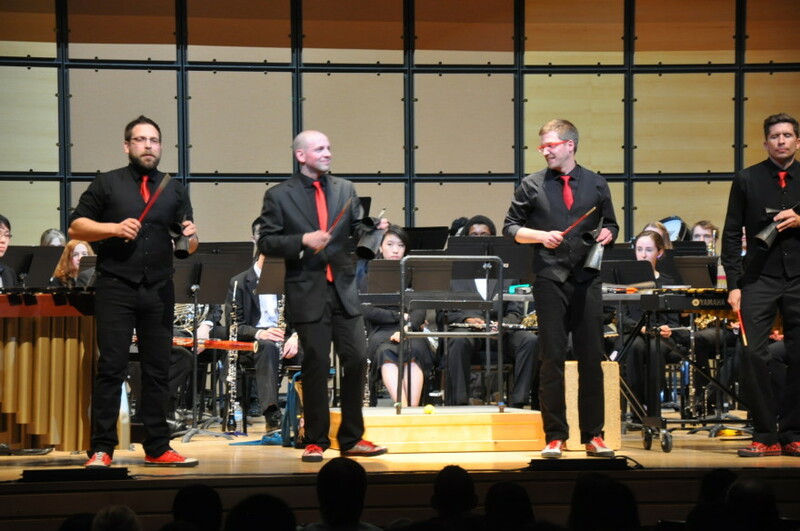 The final concert of the season would feature TorQ, the extremely talented Toronto-based percussion quartet. 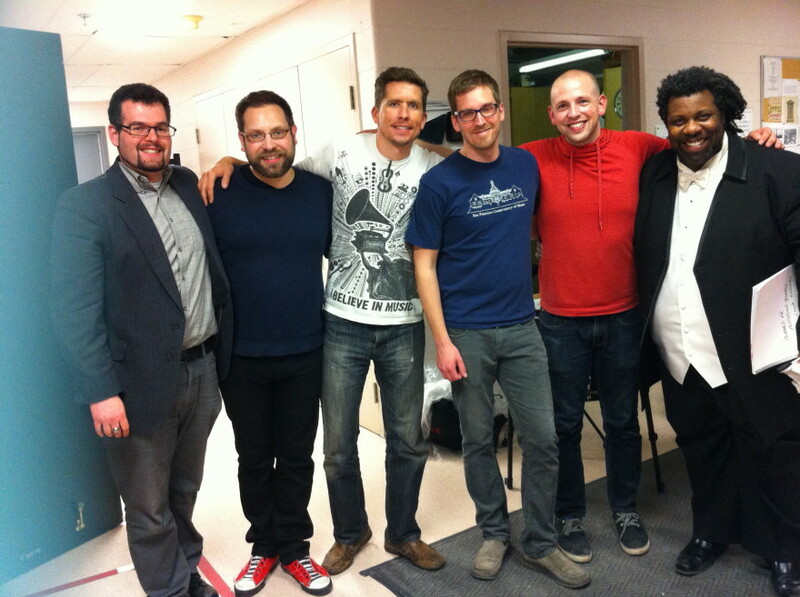 Responses from flocks of excited musicians came pouring in! 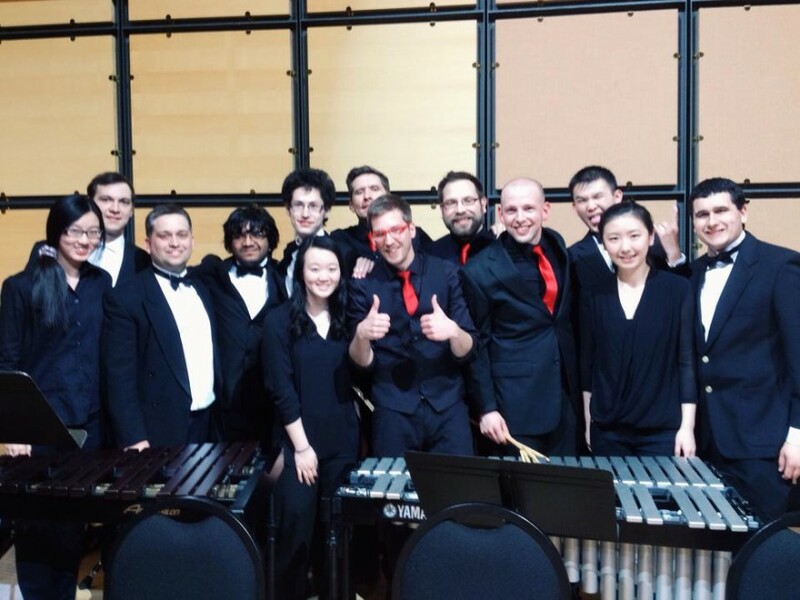 And it got better – as the season progressed, the news arrived that a new work commissioned by TorQ of composer Brian Graiser, was nearing completion and the Wind Orchestra would have the privilege of performing the world première along with their percussion heroes. As concert day approached, plans were put in place for a rehearsal – and at the appointed time, four guys arrived in four cars and unloaded a small warehouse-ful of noise-making paraphernalia which took close to an hour to assemble and position! What struck our musicians, quite apart from their awe-inspiring skill and passion for the sounds they were producing, was that they were so…well…nice!!! Richard Burrows, Adam Campbell, Jamie Drake and Daniel Morphy – four real people who made percussion come alive. TorQ and TYWO settled into their rehearsal and suddenly all the music for the now-completed Toronto Concerto, which had been practised with huge gaps where the percussion solos would be, made sense. Consumate professiionals that they are, TorQ took the time to interact with our musicians and answer their many questions. Their energy was contagious – the Wind Orchestra was eager to impress their new friends! Concert day dawned; the Wind Orchestra made their way to the Toronto Centre for the Arts for a quick sound-check on stage with their new friends, as school buses rolled up to the doors delivering close to 1,000 excited students from 16 schools across the GTA and beyond. At precisely 11:30am, the house lights dimmed and the concert was under way. The Wind Orchestra drew enthusiastic applause with their opening selection, Alfred Reed’s “Armenian Dances” and then it was time for our guest artists. 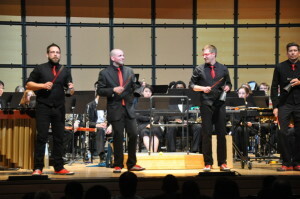 Four young men sporting red ties and red sneakers hit the stage running and launched into a program of auditory acrobatics which included “ Jerusalem”, “Spin Cycle” (inspired by the composer’s visit to his local laundromat) and “Natural Resources”. For sixty minutes, 1,000 students from elementary to senior high schools, sat mesmerized as TorQ worked their magic on them. There was even time for a little audience participation as an arsenal of small percussion pieces were interchanged among two men with mallets, with some amazing musical results. The fun continued into the evening, this time to the applause of families and friends who would be transformed from non-believers (percussion quartet? Why would I want to hear a percussion quartet?) to being totally engaged by the sounds and energy coming from the stage. Entertainment at its absolute best! 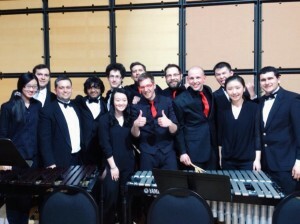 The Symphonic Winds who – with TorQ – presented a hilarious new take on Leroy Anderson’s classic “The Typewriter.” The finale and pièce de resistance for the evening was the première of the Toronto Concerto for Percussion and Wind Orchestra, with an introduction delivered by the composer. Dedicated to the city and its people whom Graiser had come to love during his student days in Toronto, TorQ brought to life the sights and sounds so graphically depicted in the music.